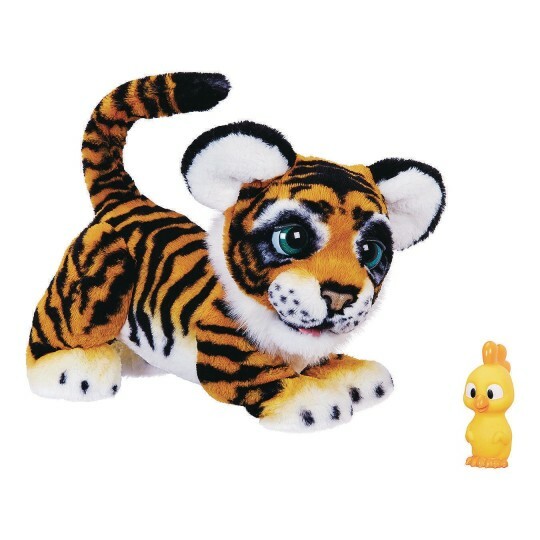 Your own playful jungle pet! This young tiger is always ready for fun and play! Imagine a jungle pet that’s also playful. Meet Roarin’ Tyler, the Playful Tiger Pet! This young tiger is always ready for fun and play. And his favorite way to play is to ROAR! It’s fun to imagine that this handsome cub is trying to sound like a full-grown wildcat. 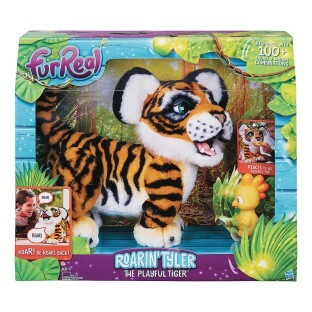 Roarin’ Tyler, the Playful Tiger pet responds to sounds and touch with 100+ sound and motion combinations. Make noise or even roar and he roars back. Pet his forehead, muzzle, or back and he’ll respond with sounds and movements. He can move his eyes, ears, head, mouth, and tail. It’s fun to watch him lean down and pose playfully as he lets out a roar! When he’s not trying to act like a full-grown tiger, this handsome cub enjoys playtime with his little play toy that looks like a chicken. With poseable back legs and soft fur, he’s easy to hug and cuddle. The perfect way to end a day of tiger cub antics. 4 “C” alkaline batteries required (not included).